The icy waters of the Arctic would hardly be most people's first choice for a day at the the beach. But for these fearless surfers it provides the perfect destination for monster waves. 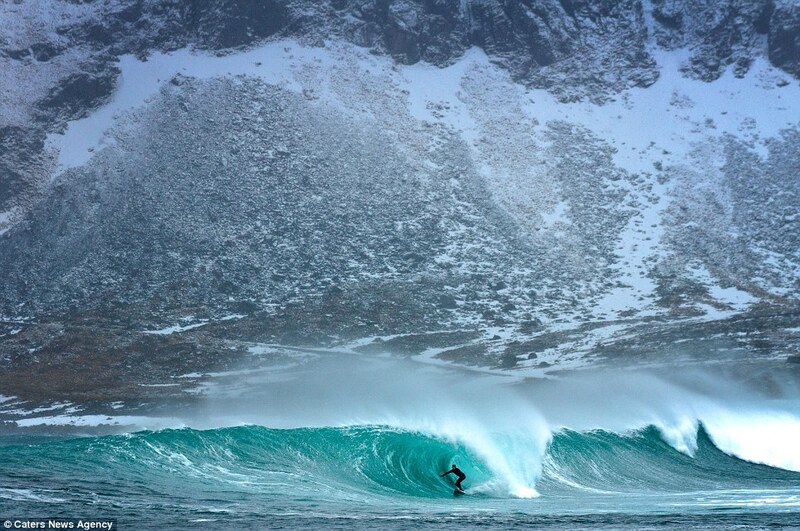 The daredevils braved the chilly conditions in the crystal clear water as they enjoyed the powerful swells off the Lofoten Islands, in Norway. Surfers Dane Gudauskas, Alex Parker and Keith Malloy normally carve up the golden beaches of sunny California but made the trip to the Arctic, where temperatures as low as just 2-3C, after hearing about the smooth waves. After putting his wetsuit on, surfer Mr Gudauskas , 26, walked the ice-covered road to the beach through snow as high as his waist - all just to reach the water's edge. They wear full wetsuits with shoes and hoods covering as much of their skin as possible. But Mr Gudauskas said that once the water hit his face it felt 'like fire'. They have to warm up before entering the water - and they contend with the risk of catching pneumonia. Golden sun rays light up the sky, but the temperatures in the water and air are still dangerously low. Mr Gudauskas said: 'When the water hit any exposed skin it would burn like fire until your body temperature warmed up from paddling. Only then could you get the mojo working. 'The region is pretty cold I'd imagine by any standard. The air was ranging from 2C to way lower depending on the day and wind chill. 'Winds were very strong through the valley and felt like they could cut you in half - it must have been minus degrees fairly often and the water was probably 2-3C. 'It's a really strange sensation entering water that cold. We're wearing wetsuits between 5-7mm so the only parts that really feel the cold when you first enter is any exposed skin so mostly just your face. 'I remember it felt like fire - an insane sensation and very uncomfortable. If you had to duck under consecutive waves you would get a crazy headache and it felt like my eye sockets were physically swelling to the point I thought they might swell my eyes shut. 'I don't think it's too dangerous unless you don't warm up. Although pneumonia would be pretty easy to get if you don't know what you're doing and that can be serious. A rainbow appears through the mist of an Arctic waterfall. 'Overall it was an awesome challenge. We were there a week and a half and the weather spanned from full snow white-outs, to melting snow on the hills, then right as we were leaving we could barely drive from the house as a blizzard nearly snowed us in. 'I've been surfing relatively my whole life - I was always around the ocean and it has been a natural progression. 'But this was extremely different from what we're used to here in California, mainly just the harsh conditions but I loved it and every part of it. Skills: The surfer performs a frontside turn on the right-hand break. Carving it up: A surfer performs a stunt on the chilly 6ft high wave. Most surfers tackle the cool waves in spring - as the Arctic Circle emerges from its dark winter during the time the snow is melting and the ocean calms down. But Dane and the team went over during wild winter chaos most people would describe as unsurfable and conquered even the most powerful of waves. Mr Parker wraps up warm in a red jacket and wooly hat as he looks out to sea. He said: 'I've seen it in the summer but in the winter it looked punishing. We wanted to see if it could be done and the weather was worse than we ever imagined. 'It was so difficult with rain building up on my camera. I tried to go swimming but I could feel my vital organs shutting down and all my blood rushing to my heart to protect it. 'I swam a couple of days but they were in the water every day. Luckily they're on their boards above the water most of the time but I think they might have started to get used to it. At around 7am GMT the fleet will pass by the island of Tristan da Cunha, a small piece of land, in the middle of the South Atlantic. "Dear inhabitants of the island of Tristan da Cunha, I hope to come on a cruise stop one day so we can become better acquainted. I believe that if you live on an island like this you will have lots of stories to tell!" 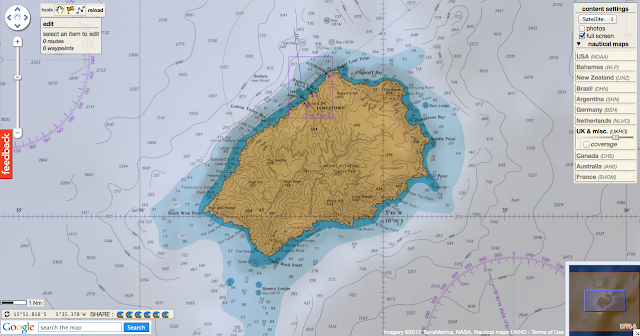 which also includes Saint Helena 2,430 kilometres to its north, and equatorial Ascension Island. New York Times-bestselling author Brian Fagan offers a vibrant history of how humans have transformed the seas into highways that connect distant cultures and shaped world civilisation. In Beyond the Blue Horizon (Bloomsbury £20), Brian Fagan – a California-based anthropologist and experienced sailor – also focuses on the seas but in this case presents us with a vivid picture of the nautical experiences endured by the first sailors who, in tiny canoes and rafts, made astonishing ocean-wide journeys more than 50,000 years ago and who laid the planet open to human conquest. Those journeys changed the course of history and Fagan gives rigour and depth to this overlooked chapter of our history. 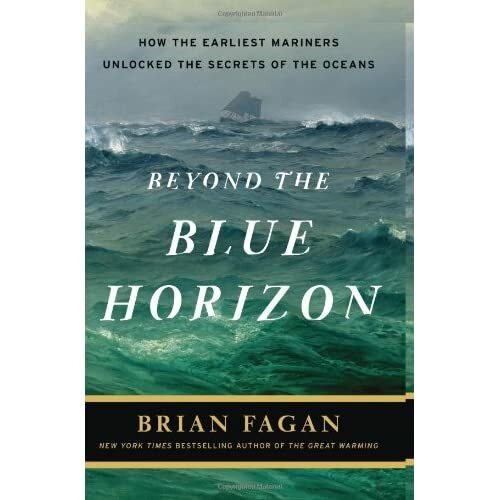 Brian Fagan’s stated aim to discover how and why the earliest seafarers set sail out of sight of land to seek distant shores is ambitious in the extreme. He starts his quest in the Far East, during the Ice Age, when humans began moving along what is now the Indonesian archipelago towards Australia, and this is where the book is at its most problematic. Not only are there no records, nor a single extant artefact, but even the very shorelines along which they sailed – or paddled – are long lost under seas that rose when the ice melted. Any conclusions as to how and why early Homo sapiens took to the waters must necessarily be based on supposition. But if anyone is up to the job it is Fagan, a professor of anthropology at the University of California and an experienced sailor. A Fijian canoe with D’Urville’s ship L’Astrolabe on its voyage of 1826-29. 1826-1827-1828-1829. (Paris: J. Tartu, 1833). Fagan speculates that the secret to decoding the seas 50,000 years ago would have been through observation, principally of the winds and the seasons, as well as such signals as the passage of migratory birds or the feel of waves refracted off an island unseen over the horizon. Such knowledge was built up over time and Fagan suggests that the first boatmen came from societies as intimately attuned to the tempers of the sea as they were to the land. He is in awe of these early navigators, and some of his theories have a delightful campfire-side quality about them: “Many Australian Aborigines are remarkably adept at handling dugouts in rough water." An Indian Ocean boom, The Triumph of Righteousness, under sail. Photograph by Alan Villiers. He can be more certain when he moves to the Mediterranean and Indian Ocean, where there is greater evidence of the various civilisations that flourished along the littoral and among the islands. Even here he is occasionally left adrift on the tides of probability and possibility, such as when he speculates that goats would start to make awkward cargo on their second day at sea. His explanation that trade flourished through “cabotage” – the practice of sailing along a coast from one inlet or harbour to another – is convincing, and he tells us of The Periplus of the Erythraean Sea, a 68-chapter description of coastlines around the Red Sea. This sort of thing would have been handed down orally from father to son, a sort of mnemonic to guide a captain along unfamiliar shores. In this way trade flourished, so mangrove poles grown in present-day Tanzania, say, might be traded from one town to another until they were matched with planks grown in India to make decent sailing boats. None of this would have been easy without first having decoded the monsoon winds and their seasonal fluctuations. It is not until he turns to the Atlantic Ocean and the men who braved her waters that he really faces up to what might impel a ship’s captain to turn west and just sail for day after day. He mentions the Norse word æfintyr, which means venture, with the suggestion of risk, brought on by restless curiosity, but he makes the point that no one would just set sail without some object in mind, and that knowledge of the seas around Britain and Scandinavia and all the way to Iceland was arrived at incrementally over the centuries. By this time boat building had advanced from dugout to the substantial cog that would take Columbus all the way across to the Americas, and throughout Fagan is fascinating on its development. He is particularly keen on fibre lashings, as well as sail technology, and the book is peppered with enjoyable stories of his own adventures, as well as shaded boxes explaining sailing terms and techniques. One gets the sense this is where his real interest lies, and the largely impenetrable reasoning behind early man’s first voyages is merely the peg on which to hang this brisk and erudite history of early boats. It is, though, seasoned with a real love of sailing and a great respect for those who took to the waters without a functioning GPS or reliable diesel engine. 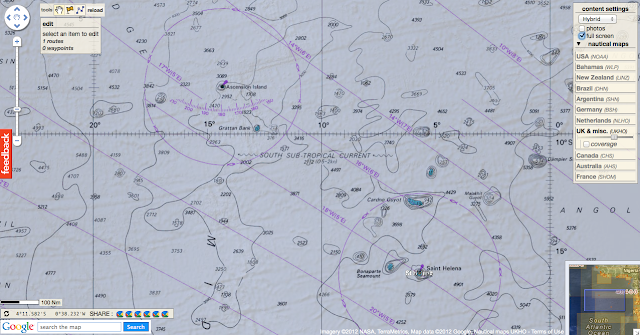 Back in October the skippers were told there was risk of large icebergs and growlers around the Gough Island waypoint, the first ice gate of the Vendée Globe, west of South Africa. 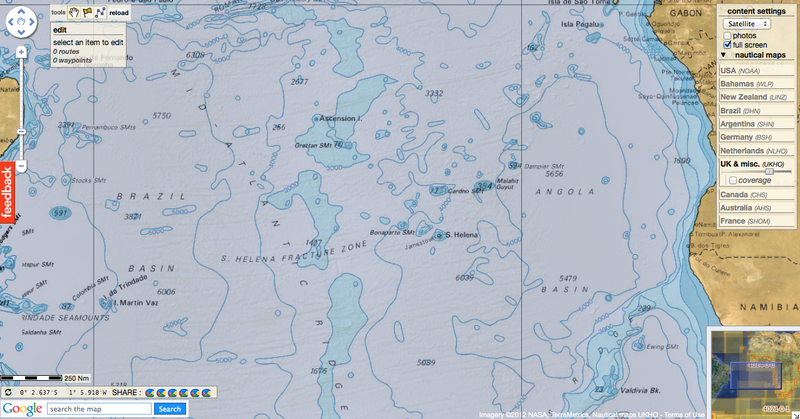 Gough Island (also known historically as Diego Alvarez) is a volcanic island rising from the South Atlantic Ocean to heights of over 900 m (2950 ft) above sea level with an area of 35 square miles (91 km2). It is part of the Tristan da Cuhna group. Gough Island is a subantarctic island and UK overseas territory situated in the South Atlantic Ocean. Gough Island has no sheltered harbour or anchorage. The only suitable landing place for boats is at Glen Anchorage in Quest Bay on the island's east coast. SA Agulhas, on a relief expedition, departs from Cape Town to Tristan da Cunha then onwards to Gough Island on an annual relief voyage. This ship carries cargo and passengers. The island possesses an extraordinary wealth of unique biodiversity and has being called the world’s most important seabird island. Not surprisingly, it has been afforded UNESCO World Heritage Site status. Yrvind implements test sailings with his boat Yrvind.com in Stockholm archipelago. When faced with the most ferocious waves on the planet, most people would seek protection in the largest, sturdiest vessel they could find. But when Swedish pensioner Sven Yrvind sets out on his ambitious mission to circumnavigate the globe, it won't be in a hefty ship piled high with food, creature comforts and telecommunications equipment. Instead, the 73-year-old plans to traverse the high seas cocooned in a sailboat only slightly bigger than a bathtub. For many, the proposition of sailing non-stop around the world for a year-and-a-half in a vessel just three meters-long will sound rather ambitious, and coming from a man well past the retirement age, downright far-fetched. Indeed, few would likely take the idea seriously were Yrvind not one of the world's most respected boat-builders. Click on the pindrops above to trace Sven Yrvind's proposed circumnavigation route. During his accomplished life he has given lectures to the Swedish king and queen and received awards from the prestigious Royal Cruising Club in Britain, among others. "People have said it's a suicide mission," said Yrvind. "But a big boat is actually more dangerous than a small one. You've got bigger forces throwing you around -- a bigger engine, a bigger beam, a bigger deck. "My small boat is like a little capsule -- nothing can happen to you. It's like throwing a bottle in the water -- it will capsize, it will pitchpole (somersault), but it will always come back up," he added. If successful, Yrvind will make history for sailing the smallest boat around the world without docking on land. The record is currently held by Italian Alessandro di Benedetto, who in 2010 circumnavigated the globe in a 6.5 meter yacht -- more than double the size of Yrvind's creation. Yrvind, from the small village of Vastervik in south east Sweden, started building the ground-breaking vessel in March. Now half-complete, he is reluctant to put a time on its launch. Named Yrvind Ten after its 10 foot length, the miniature vessel will be just 1.8 meters wide with two six meter-tall masts. Weighing 1.5 tons, it will be made out of a composite foam and fiberglass material which, he says, is "excellent for insulation and floatation." 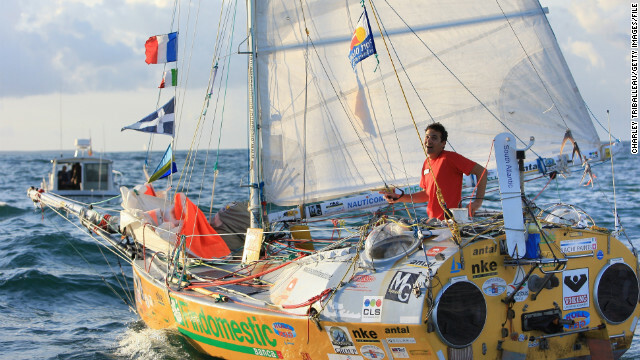 Powered by wind, solar panels, gel batteries and a foot crank, Yrvind Ten will set sail from Ireland in a 48,000 kilometer return journey around the globe. 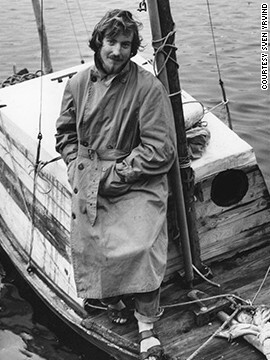 Sir Robin Knox-Johnston became the first person to single-handedly sail around the world in a 9.8 meter yacht, in 1969. 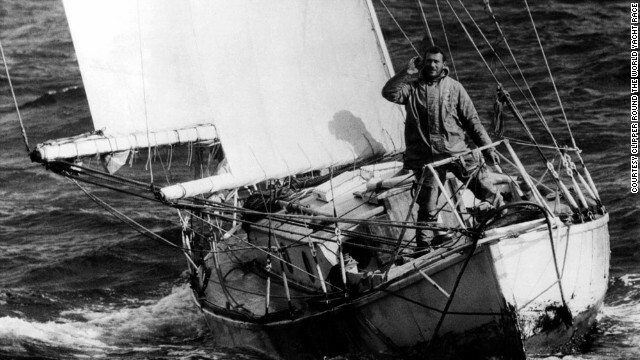 Sir Robin Knox-Johnston, the first person to sail around the world in 1969 in a 9.8 meter yacht, said there was a real possibility Yrvind would complete the voyage. Briton Knox-Johnston, who also founded the Clipper Round the World Yacht Race, added that many people had thought his own bid to circumnavigate the globe was impossible at the time. "One of the biggest challenges he'll face is when he's coming up against these massive 25 meter waves in the Southern Ocean. In a boat that size he's just going to be rolled around and around like he's inside a giant washing machine," Knox-Johnston said. "He might also find he's using a lot more energy -- and will need a lot more food -- being rolled around like that." The Swede will collect rainwater in sails, funneled by a hose to a tank. With no heating equipment on board, he'll rely on 400 kilograms of muesli and sardines, supplemented with vitamin tablets and fish caught from the sea. "I need just half-a-kilogram of food a day and this will give me enough food for 800 days," he said. "In the beginning I will have fruit but obviously that will run out. I also have a friend in Melbourne with a boat who will come out with supplies." The self-described "recluse" plans to spend his days swimming, philosophizing and reading more than 400 books, which weigh around 100 kilograms. "On land, people are watching TV, driving cars in traffic, smoking, drinking -- it's not healthy," Yrvind explained. "Out at sea it's a cleaner environment -- mentally and physically. When I come back I will be a healthier, younger person. This will prolong my life, not the other way around." Yrvind was inducted into the Museum of Yachting's Hall of Fame in 1988, for his many solo expeditions. 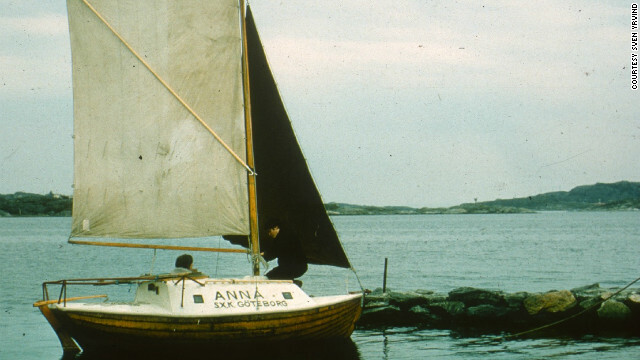 In 1968 he sailed four meter boat "Anna" (pictured) from Sweden to England. Growing up on the small Swedish island of Branno in the North Sea, Yrvind quickly learned to sail in an area so remote he needed to cross water simply to buy a loaf of bread from the shop. In his 50-year career building boats, Yrvind has been lavished with awards from around the world. 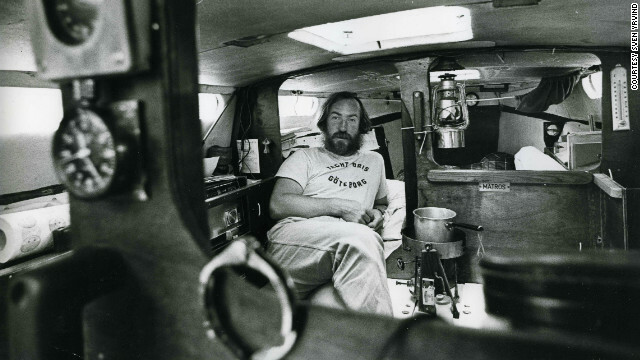 In 1980 he received a Seamanship Medal from the Royal Cruising Club in Britain for single-handedly sailing a six meter boat around the stormy waters of Cape Horn, Chile. 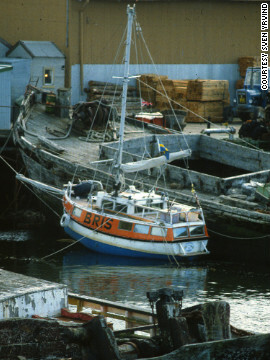 The boat was named Bris, meaning "breeze" in Swedish. "I built her in 1972 and sailed her until 1982, criss-crossing the Atlantic many times," Yrvind said. Eight years later he was inducted into the Museum of Yachting's Hall of Fame, based in Newport, Rhode Island, for his many single-handed expeditions. The museum also has one of Yrvind's boats on permanent display -- a six meter yacht he built in his mother's basement and sailed from Sweden to Newport in 1983. Yrvind in the six meter yacht he built in his mother's basement and sailed from Sweden to Newport in 1983. The boat is now on display at the Museum of Yachting in Newport, Rhode Island. In 1989 Yrvind also built and sailed a 4.5 meter boat from France to Newfoundland, now on display at the Swedish National Maritime Museum in Stockholm. And the sprightly septuagenarian is no closer to slowing down -- last year sailing a tiny 4.5 meter-long boat from Ireland to the Caribbean. Yrvind, who is also on the look-out for sponsorship, hopes his boat will not simply break the record books, but pave the way for a new environmentally-friendly design for living. "We are on Earth living beyond our resources -- oil is running out, fossil fuels are running out, water is running out," he said. "If I can show I can live on a boat 10 foot-long for more than a year, with all the food I need with me, I think it might benefit mankind." For a man who "loves all things small," should he accomplish the feat it would be a huge achievement in the history of sailing. Snoopy Sloop 8, the latest robot sailing boat from Team-Joker, may attempt to cross the Atlantic, from the UK south coast to the USA east coast before the end of 2012. This is part of the friendly, international competition known as MicroTransat. The video starts with recent clips of Snoopy Sloop 8 being tested, then shows the history, including sinkings and rescues, since May 2008. A retired Nato scientist has launched what he hopes will be the first unmanned boat to cross the Atlantic. Robin Lovelock's 5ft (1.5m) boat, Snoopy Sloop set sail from the Hampshire coast. A Global Positioning System (GPS) computer is designed to pilot the boat for the 5,000 miles (8,000km), but he admitted it would be a "real struggle". 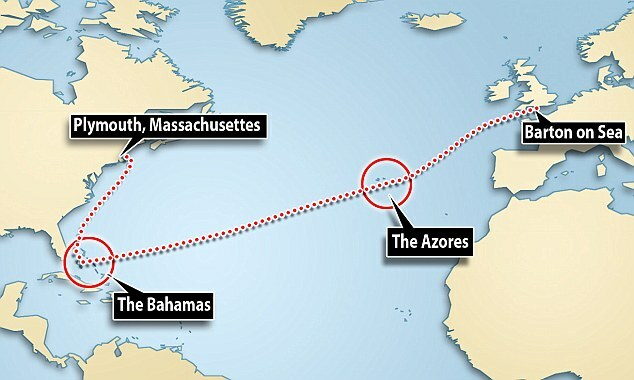 It is thought no unmanned boat has ever crossed the Atlantic. Recent tries hit weather and technical problems. Mr Lovelock has developed the £450 boat on Bray Lake near his home in Sunninghill, Berkshire, over the past four years. He is making the attempt as part of the Microtransat Challenge (web) to become the first unmanned vessel to cross the Atlantic Ocean from a point to the south of Ireland. A tracking device on board the solar-powered boat allows internet users to track its progress on its pre-programmed journey from Barton-on-Sea to the Bahamas on his website. Travelling at 3mph, it would take about six months to complete the trip. He said: "We'll just throw it into the water and see if we're lucky. "I'm kissing bye-bye to a lot of hard work - let's hope it doesn't all end in tears. "The chances of something hitting it are pretty remote - it should just get brushed aside." Alongside the home-built technology on the boat is a model of cartoon dog Snoopy at the bow, which Mr Lovelock said showed he was not taking the project "too seriously". "If it doesn't work I've got plenty of other boats and bits of boats sitting around the house," he said. Since 2010, two French boats have foundered in bad weather and a University of Aberystwyth vessel suffered technical failure. 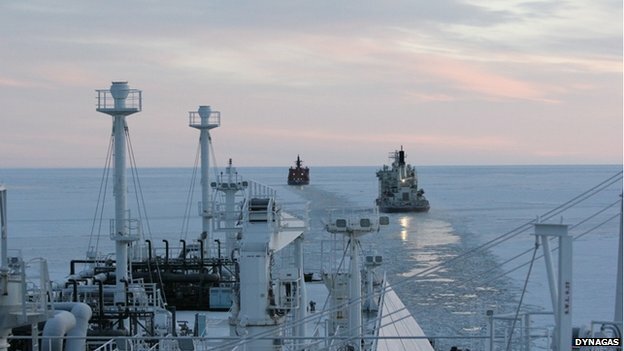 A large tanker carrying liquified natural gas (LNG) is set to become the first ship of its type to sail across the Arctic. The carrier, Ob River, left Norway in November and has sailed north of Russia on its way to Japan. The specially equipped tanker is due to arrive in early December and will shave 20 days off the journey. The owners say that changing climate conditions and a volatile gas market make the Arctic transit profitable. The tanker was accompanied by the Vaigach and 50 Let Pobedy nuclear-powered icebreakers during its nine-day voyage along the Northern Sea Route. The tanker, which traveled in the Arctic at an average speed of 12.5 knots left the route on November 9 and is currently heading for the Japanese port of Tobata. Built in 2007 with a strengthened hull, the Ob River can carry up to 150,000 cubic metres of gas. The tanker was loaded with LNG at Hammerfest in the north of Norway on 7 November and set sail across the Barents Sea. It has been accompanied by a Russian nuclear-powered icebreaker for much of its voyage. The ship, with an international crew of 40, has been chartered from its Greek owners Dynagas by the Russian Gazprom energy giant. It says it has been preparing for the trip for over a year. "It's an extraordinarily interesting adventure," Tony Lauritzen, commercial director at Dynagas, told BBC News. "The people on board have been seeing polar bears on the route. We've had the plans for a long time and everything has gone well." Mr Lauritzen says that a key factor in the decision to use the northern route was the recent scientific record on melting in the Arctic. "We have studied lots of observation data - there is an observable trend that the ice conditions are becoming more and more favourable for transiting this route. You are able to reach a highly profitable market by saving 40% of the distance, that's 40% less fuel used as well." But melting ice is not the only factor. A major element is the emergence of shale gas in the US. 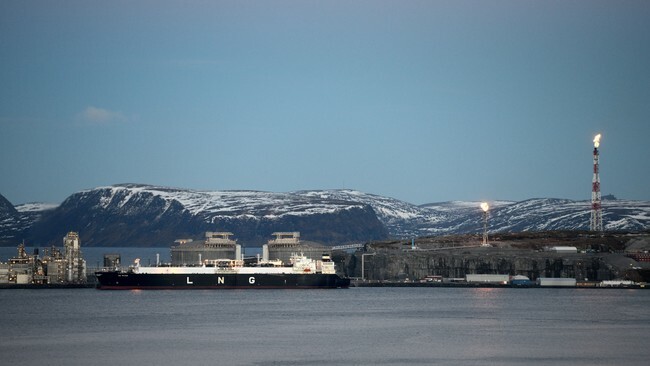 The Norwegian LNG plant at Hammerfest was developed with exports to the US in mind. But the rapid uptake of shale in America has curbed the demand for imported gas. loaded at Hammerfest LNG terminal in Norway. 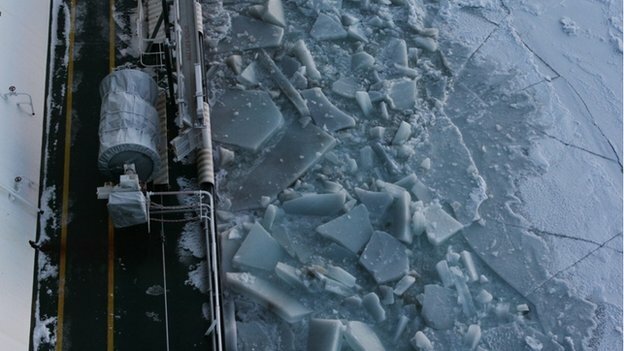 "The major point about gas is that it now goes east and not west," says Gunnar Sander, senior adviser at the Norwegian Polar Institute and an expert on how climate change impacts economic activity in the Arctic. "The shale gas revolution has turned the market upside down; that plus the rapid melting of the polar ice." He stresses that the changes in climate are less important than the growing demand for oil and gas. "The major driver is the export of resources from the Arctic region, not the fact that you can transit across the Arctic sea." According to Viktor Olersky, Russia’s Deputy Transportation Minister, the LNG tanker’s voyage marked another stage in the development of the new high-latitude sea route linking Europe with Asia-Pacific countries. He said that Russia, which owns the world’s largest fleet of nuclear-powered icebreakers, opened a new page in the history of Arctic navigation. 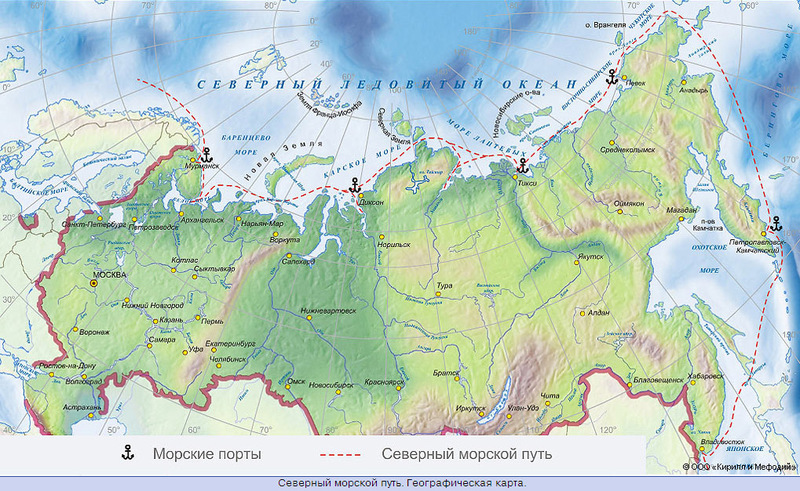 “We proved the possibility of such voyages [of high-tonnage ships along the Northern Sea Route] and are not going to stop at this stage,” Olersky said. He also said that experts will analyze data collected by Sovсomflot shipping company team during this experimental voyage in order to upgrade regulations of the Northern Sea Route navigation. But Gunnar Sander says there are limits to the growth and some perspective is required. "Nineteen thousand ships went through the Suez canal last year; around 40 went through the northern sea route. There's a huge difference." 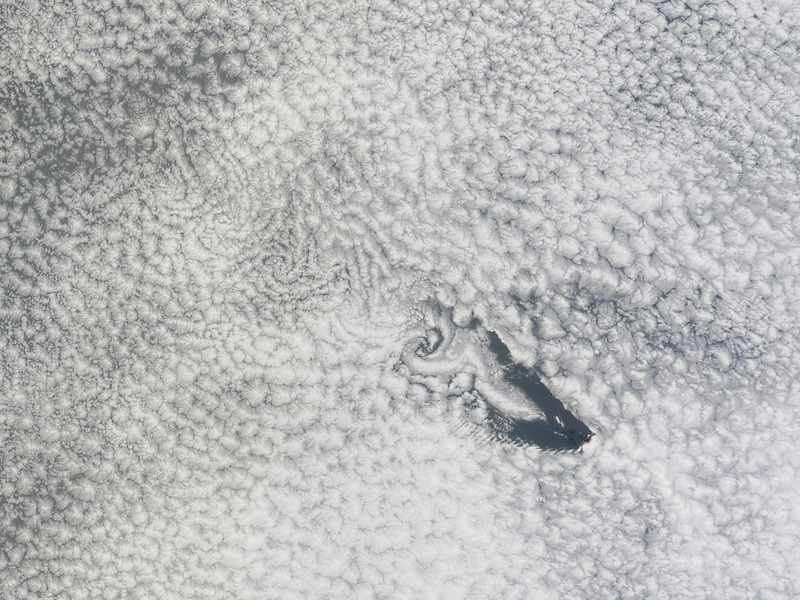 On 15 November 2012, cloud vortices stretched away from the St Helena island to the west-northwest. When moving air masses encounter an obstacle such as a volcanic island, the wind flow is disrupted. Downstream from the obstacle, von Karman vortices form. These double-row vortices alternate their direction and rotation. St Helena is a small, rugged volcanic island in the southern Atlantic Ocean. At its highest point, Mount Actaeon, the island rises 818 meters above sea level – high enough to affect cloud formation. 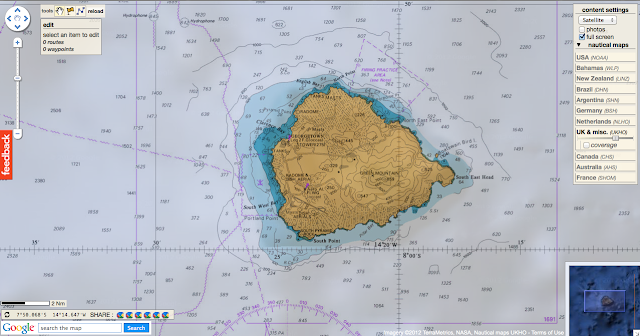 Located more than 1,100 miles west of Africa, St Helena is as remote as it is rugged. The island was uninhabited when the Portuguese first discovered it in 1502, and became famous centuries later as the final home of Napoleon Bonaparte of France.